What is Socially Engaged Photographic Practice? Britain has a long tradition of socially engaged photographic practice. An example of this is the Mass Observation movement dating from 1937 which included photographers such as Humphrey Spender who sought to counteract the middle class stereotype of the working classes and worked alongside writers to record the way people talked, interacted and how they spent their leisure time. Another fantastic example of the practice is Jo Spence’s work in the 70s and 80s, whose collaboration with Terry Dennett meant community projects such as The Hackney Flashers Collective took shape under an activist and shared approach. The Hackney Flashers Collective engaged women in questioning the status quo through feminist approaches with works such as ‘Who’s Holding the Baby?’ and ‘Women in Work’. Within this rich tapestry of history, Open Eye holds its latest exhibition Culture Shifts: Local. 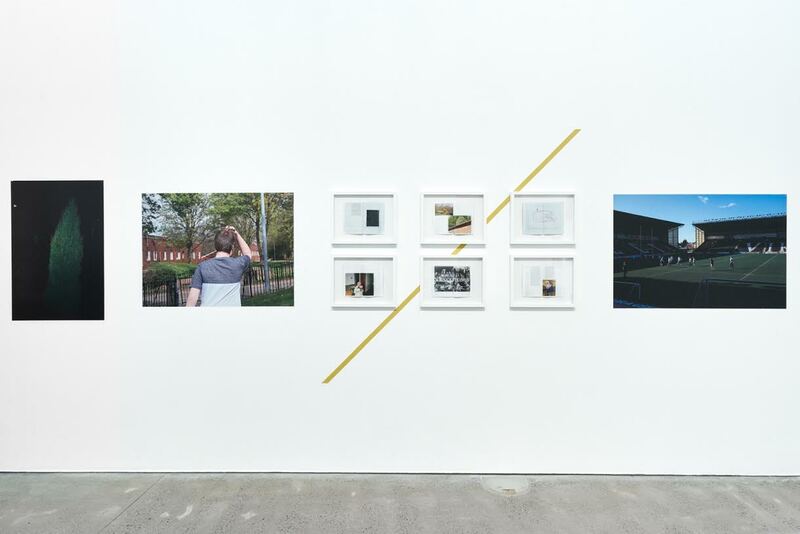 The talk held on 12 October in the gallery space, entitled What is socially engaged photographic practice? was an attempt at understanding three out of the eight projects featured in the exhibition through the prism of theory, community approaches and wellbeing achieved through photography. Discussing this multi-faceted question were Liz Wewiora, Creative Producer of Culture Shifts and two of Culture Shifts’ practitioners, Gary Bratchford and Robert Parkinson. Wewiora is a photographer and most recently Mersey Ferries artist in residence. She is also studying for a practice-based Masters at MMU on socially engaged photographic practice and its outcomes. Bratchford is a Senior Lecturer of Photography at UCLAN and his academic background encompasses study areas such as Sociology, Anthropology and Film. Robert Parkinson holds a Masters in Photography from MMU and his work explores human interactions within the landscape, often working with community groups to understand urban disintegration and construction collectively. Wewiora acted as interviewer to Bratchford and Parkinson, but also relayed Tony Mallon’s practice with the Women from Northwood Golden Years Group in Kirkby. Bratchford and Parkinson worked together as facilitators in a project which they eventually titled ‘As and When’ with two groups; The Women of Windmill Hill in Runcorn, and the Widnes Vikings Golden Generation Group. Parkinson described how there was a subgroup or committee of participants in the Widnes project who facilitated the project themselves when Parkinson and Bratchford weren’t there. He detailed their method as ‘dropping in’, which seemed non-hierarchical and trusting towards the participants/ Bratchford explored his assessment of the project from an academic point of view by asking “Is the value in the project in and of itself?”. His response was frank and direct. He said, “People turned up” and explained this as a valued part of the project in terms of measuring its wellbeing impact. The wellbeing outcome and this “self-determined making” was one of great successes of the project, in that The Women of Windmill Hill have continued the project and named themselves “Windmill Women Amateur Snappers”. This speaks volumes of Bratchford and Parkinson’s laid-back and collaborative approach. In merely acting as facilitators, the women felt encouraged and allowed to become practitioners in their own right, independent of outward intervention. ‘But is it important that there are “good” photos in the exhibition?’ a woman asked. Bratchford answered that there was a level of aesthetics that was expected from the gallery and there was sometimes a disparity between what they, as facilitators thought were ‘good’ images and what the participants viewed as ‘good’ images. He explained that there was a curatorial process and certainly a collaborative approach when selecting the images. One particularly striking image, by Irene, which was shown originally at the Brindley, in Runcorn forms the centre point of ‘As and When’. In it, a teenage lad with a thick head of dark auburn hair has his hand on his head as if representing the inner turmoil of the area. With his back turned to us, we have no way of knowing whether there’s any truth in this or whether this is just an old trap of photographic criticism and interpretation. Bratchford and Parkinson said that Irene hadn’t been sure she wanted to choose this image, but that as a collective they appraised this image as one of the main choices for their exhibition. Wewiora, Bratchford and Parkinson all stressed the importance of equality in the collaborations and Wewiora also expounded on the fact that there was cross-pollination between the wider groups, such as the Kirkby women visiting those in L8 (a project that appears in Open Eye but wasn’t discussed at length in the talk). Also, Open Eye, Wewiora explained, acts as a wider hub and meeting point for the groups with its new café area. The conversation was fluid with all three speakers acknowledging the limitations of socially engaged practice in terms of artistic merit. The real value, they insisted, was in the conversations, the shared humanity and understanding of people and places. The process in this instance was key, and the lasting legacy is the on-going “self-determined making” of groups such as The Women of Windmill Hill. This event was part of Culture Shifts: Local, on display at Open Eye Gallery until 22 December. Eli Regan is a NCTJ qualified journalist, photography graduate and freelance writer based in Warrington.